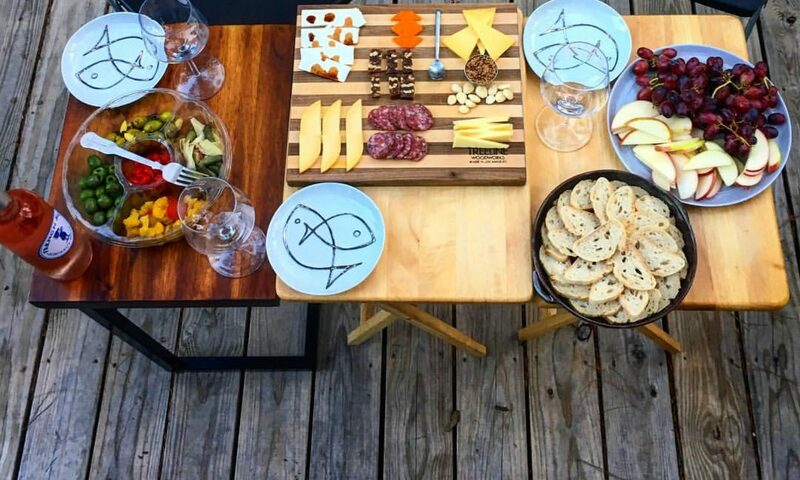 One of the many blogs Jill follows is Joy the Baker. 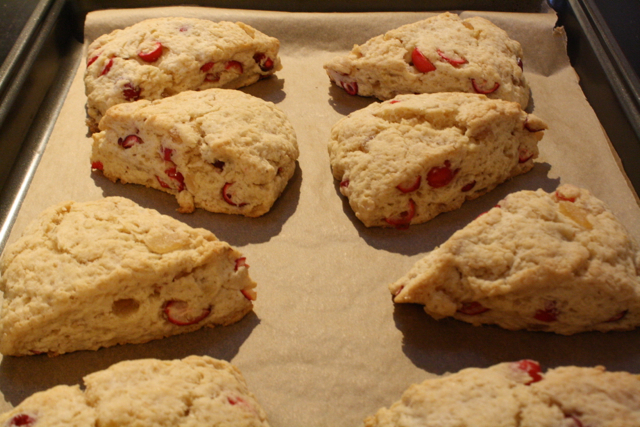 This blog recently featured a recipe for Fresh Cranberry Cream Scones with Candied Ginger, a recipe adapted from the Joy of Baking website. After reading the Joy the Baker blog post about these scones, Jill sent me a link to the recipe with a note that said “I might really really want to make these this weekend.” Excited about the scones, I bought the ingredients on the way home from work that evening and made them Saturday morning. You can access the recipe from the Joy the Baker blog site here: Fresh Cranberry Cream Scones with Candied Ginger. One of my favorite components of this recipe is the candied ginger, which provides a sweet, tangy heat that complements the tartness of the fresh cranberries. 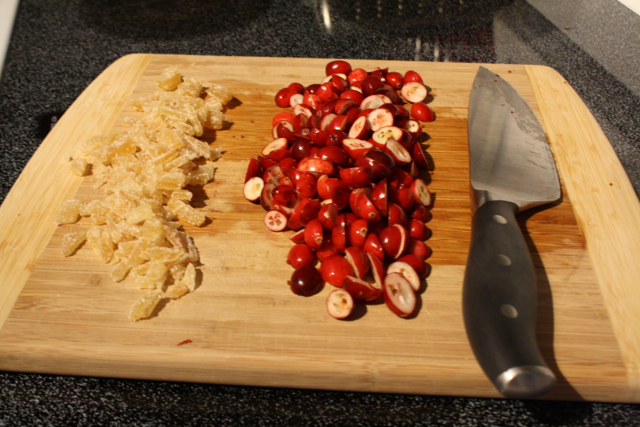 Next time I make these scones though, I will probably chop the cranberries and the ginger into smaller pieces. I think this would help distribute the flavors more evenly throughout the scones. I was a little concerned that the tartness of the cranberries and the strong flavor of the candied ginger would be overpowering, but the butter and the cream, in addition to making the scones rich and delicious, toned down both the ginger and the cranberries. I decided to round out the scone breakfast with a couple of slices of bacon because, well, I just like bacon. 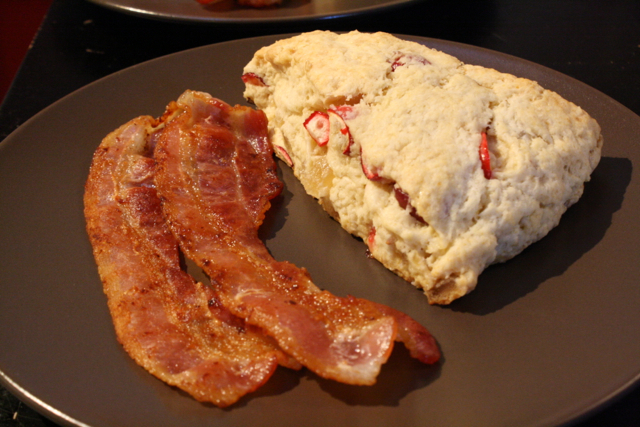 The bacon with the scones also developed a good salty-sweet flavor combination. This breakfast definitely added joy to my Saturday morning.